Life is a toilet, but technically we are the ones who fill it, and thus, we are full of it as well. The toilet is not a place of residence. You get to leave the toilet when you are finished, unlike real life when you do not know when it will be over. Breaking the habit of yourself requires a heavy dose of appreciation. You show up every day at a job you hate. Your marriage makes you feel miserable. You hate where you live. How the heck did I get here? How the heck do I get out? Everything shows up for us based on what we believe to be true, what we believe we deserve. There is nothing more preventative from moving ahead than living in the past and continuing negative stories we tell ourselves. Misfortune can be an incredible opportunity to notice we are stuck in the state of mind that will never lead to fulfilled desires. Adversity could be a wake-up call telling us we are out of harmony with the life we want. I doubt that any of us have become masters of our Universe. Adversity and misfortune will probably end up in the mix of our daily life. We need to learn how to gain the maximum benefit from it. Maybe we feel like a shadow version of the person we know we are. If any of this sounds familiar to you, now is an excellent time to contemplate on what it is you want. Reassess your goals and remind yourself you are in the driver seat of your life. Stop trying to figure it out all on your own. The truth is sometimes we do not see what we are doing wrong, and we need someone else to point it out. It is usually embarrassingly obvious when we look at it, but we would have never noticed it if not for an expert or a friend offering us another perspective. You are not alone in your struggles. The same handful of issues repeat themselves in so many lives. Put your insights into practice. You have to get clear on your purpose and vision. Thankfully, I woke up to who I really am. Beyond my body, thoughts, emotions, titles and roles, I discovered I was a soul in a body, not a body with a soul. *This article is not intended to provide and does not constitute medical, legal or other professional advice. This article was written to support, not replace medical or psychiatric treatment. Please seek professional care if you feel you have a condition. 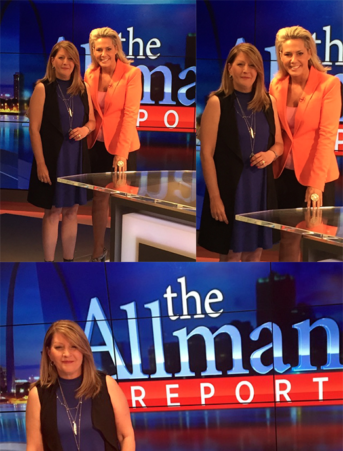 Joy Mills’ interview with Lynda Brotherton on ABC KDNL 30 St. Louis. The Allman Report Friday, June 24, 2016. To view the interview, visit ABC KDNL 30 St. Louis The Allman Report.